Please do NOT feed our donkeys. All our favourite cartoon donkeys like Eeyore and "Donkey" in Shrek are actually very fat. 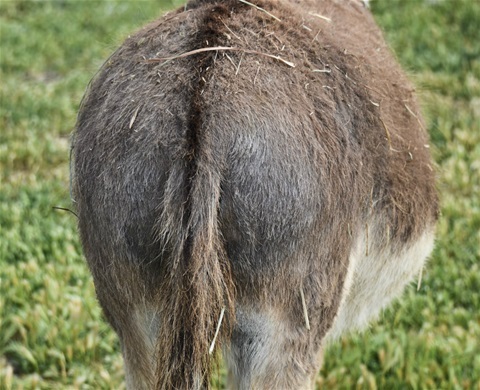 In real life a donkey's "rear end" should look much thinner than a horse or pony. This makes some people think that a donkey is too thin but this is not true. We have been trained by the Donkey Sanctuary in donkey welfare. 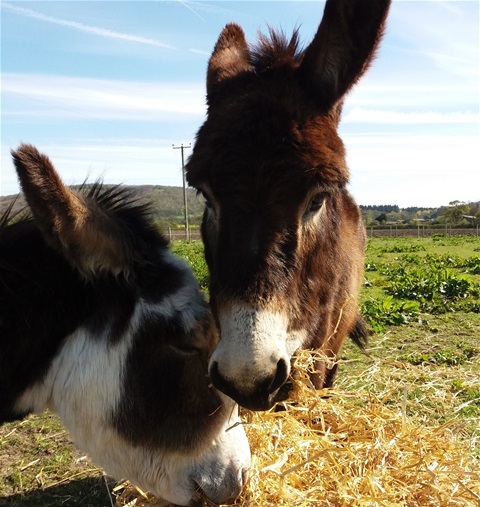 It is very important to us that our donkeys are as healthy as possible and you can help us with this. Our donkeys are checked daily, but feel free to email us if you have concerns. Donkeys are quite different to horses and are fed on different food. Being overweight or fed incorrectly can be extemely dangerous and even fatal for donkeys. Being overweight can cause a serious disease called hyperlipaemia. Donkeys do not wear metal shoes like horses and ponies, but they still need to have their feet looked after by a farrier. Just like horses and ponies their teeth need to be seen by an equine dentist regularly. Donkeys need a shelter to help protect them from the worst of the weather but do not need to live in a stable. Young healthy donkeys do not need to wear rugs at any time of the year. We check our donkey's weight regularly to make sure they are healthy. You may see us measuring round their tummies which is part of this process. Donkeys also have their feet cleaned regularly and are groomed to keep their coats in good condition. We know it is tempting, but they are carefully fed a specialist diet to keep them healthy. Even apples are harmful. The kindest thing to do is not feed them anything. A water trough in the paddock provides them with fresh clean water. The blue barrels in the paddock are for food and treats not water. We also put treats like brambles and thistles in the tubs or a haynet in their shelter for them to eat. You may notice that some of the paddock that the donkeys live in is fenced off from time to time. This is to restrict the amount of grass that they eat. A large part of their diet is Barley Straw, and too much grass is bad for them. They require fewer calories than a pony of the same size and enjoy trickle feeding on highly fibrous feeds similar to those found in their natural desert habitat. Cereal based foods and sugary treats are not good for donkeys. We sometimes put some branches in the paddock for the donkeys to eat and chew. These are from particular trees that are not poisonous for them, and give them additional fibre as well as mental stimulation. Donkeys are intelligent and it is important to keep their minds occupied. This is called enrichment. Enrichment gives the donkeys things to do, increases their ability to cope with challenges, reduces stress and gives them exercise. We put things in their field for them to play with and explore. Buckets of herbal tea, treats wrapped in carpet or towels, food hidden in wellington boots, logs to strip off the bark. The list is endless but they are all there to help keep the donkeys healthy.